There is no doubt that DevOps is a top of mind subject for application developers. However, one challenge with DevOps is test data management (TDM). Agile development requires agile data presentation, and traditional approaches to TDM cannot deliver the required responsiveness. In this blog, I will compare and contrast two solutions for automated TDM - Actifio and Delphix. Not so long ago, there used to be a time when the roles of DBAs and application developers (using the databases) were fairly distinct. DBAs, true to their name, were really database administrators. They were primarily tasked with creating objects (views, tablespaces, indexes), backed up and recovered data, and managed the use of disk resources and in general, looked after the database environment end to end. In the world of Oracle DevOps, agility is key and yet it must be balanced with information security. Unfortunately, the headlines are filled with stories of companies who have not gotten the balance correct resulting large scale data breaches that cost companies millions of dollars financially and countless more in reputation. As you think about your risk, ask yourself “how many copies do I have of my critical databases with private customer information?” For most companies, the answer is “more than we would like.” Every database copy represents a potential target for a hacker, and so it is critical to have central control and to provide consistent and reliable masking. Even top cloud vendors like Salesforce & Amazon use Oracle database for one or more critical apps. The odds of finding an enterprise running a mission-critical application without an Oracle database is extremely low. The new buzzword for DevOps is “continuous.” We have continuous integration, continuous delivery, continuous obsolescence and for many developers, continuous consumption of Five Hour Energy. Yes, the world of DevOps has radically changed development as we know it and will continue to do so for the foreseeable future. I’d like to share a fascinating insight from a customer. Our sales team asked me to join them for a face-to-face discussion with the company’s VP of development and his team. After the introductions, he explained the key problem. His Dev & QA teams were struggling to execute their unit testing, build integration testing, and QA testing fast enough, in spite of automation. They identified that too many critical issues were being found late, in UAT, which delayed their release cycles and led to a lot of heartburn inside the company. When they looked into the cause of the quality issues, they found that for 80% of the release cycle they were testing against low-fidelity synthetically generated test data, instead of data from production. The code testing against such dummy data did not expose the code defects earlier in the test cycles. We’ve seen the benefits that digital businesses can get by adopting DevOps methods for application development. At the same time, the substantial importance of business applications cries out for the fastest, most efficient development resources. If DevOps is about collaboration and process, application execution and output are all about the power and capabilities of technology. There is no better way to hear from potential end-users than at a Trade Show, and Oracle Open World (OOW) in San Francisco is a great example of this. At our booth last year we had the opportunity to talk to teams of DBAs from a very wide range of enterprise organizations and hear about their day to day frustrations. We were recently joined for a Webinar by Jay Lyman of 451 Research. Our purpose was to highlight results from a 451 Research project and share some specific insights about enterprise DevOps and cloud adoption. 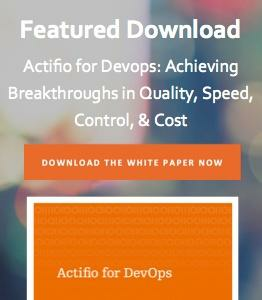 I also presented an overview of how Actifio helps streamline and automate DevOps. I’ll summarize Jay’s key points here but I encourage anyone interested in the topic to view the entire webinar which includes the Actifio DevOps capabilities overview. Link. It is becoming more and more common for enterprises to implement DevOps practices. The benefits that come from this implementation are exponential. Heading into the new year, we think it’s important to share these 10 articles to show how leaders are adopting DevOps and the value it provides.